SAN BRUNO, Calif. -- The breaking news about Tuesday's shooting at YouTube's headquarters in San Bruno, California, had a distinct difference from others in the past: The person suspected of opening fire is a woman. Police believe she shot and wounded three, before killing herself. San Bruno police identified the suspect late Tuesday as Nasim Najafi Aghdam, 39. Women made up for only four percent of suspects in mass shootings in the U.S. between 1966 and 2016, according to Jaclyn Schildkraut, a national expert on mass shootings research and assistant professor of public justice at the State University of New York (SUNY) at Oswego. "It's definitely something that's very uncommon," Schildkraut told Crimesider. Tuesday's shooting may not qualify as a mass shooting. The Gun Violence Archive defines a mass shooting as four or more people shot or killed -- not including the shooter -- and bases the definition only on numbers, not the shooter's motivation or the circumstances in which the victims were shot. Another definition that's been used by the federal government only includes events with multiple fatalities. Neither methodology would include Tuesday's shooting at the YouTube campus. But there several experts, publications, research groups and law enforcement agencies that track mass shootings in the country, and each use varying definitions. Schildkraut and her research partner H. Jaymi Elsass, who wrote "Mass shootings: Media, Myths and Realities," define a mass shooting as "an incident of targeted violence carried out by one or more shooters at one or more public or populated locations" with multiple victims, which can include both injuries and fatalities. In addition, both the victims and the locations are chosen by the shooter either at random or for their symbolic value, and the event happens within a single 24-hour period, though most span only minutes. The motivation of the shooting must not be related to gang violence or targeted militant or terroristic activity, according to Schildkraut's definition. According to Schildkraut's research, there were 340 mass shootings in the U.S. between 1966 and 2016 with 352 perpetrators. Only 14 of the perpetrators were female while 12 of them acted alone, Schildkraut found. The crimes include a girl who in 1979 opened fire on a San Diego elementary school from her home across the street, killing two and injuring nine; a former U.S. postal worker who in 2006 killed her neighbor and then six others and herself at the Goleta, Calif. mail processing plant where she used to work; and the 2015 San Bernardino workplace massacre in which a husband and wife opened fire on health inspectors at the Inland Regional Center, killing 14 and injuring 24. Schildkraut says women mass shooters are rare, and attributes this to several factors -- the motive of many male shooters has been attributed to revenge or "aggrieved masculinity," while women who kill are more likely to murder family members or their children, she said. Women are also less likely to use a gun in carrying out the crimes, she said. Of the 14 women Schildkraut found to commit mass shootings in the country between 1966 and 2016, Schildkraut cited nine instances in which the shooting was carried out at a workplace or school. For both men and women shooters, these are common targets to choose when planning an attack because of the ease of access to the victims and the shooter's possible knowledge of their routines. Schildkraut found women are more likely to target a school or workplace than men. 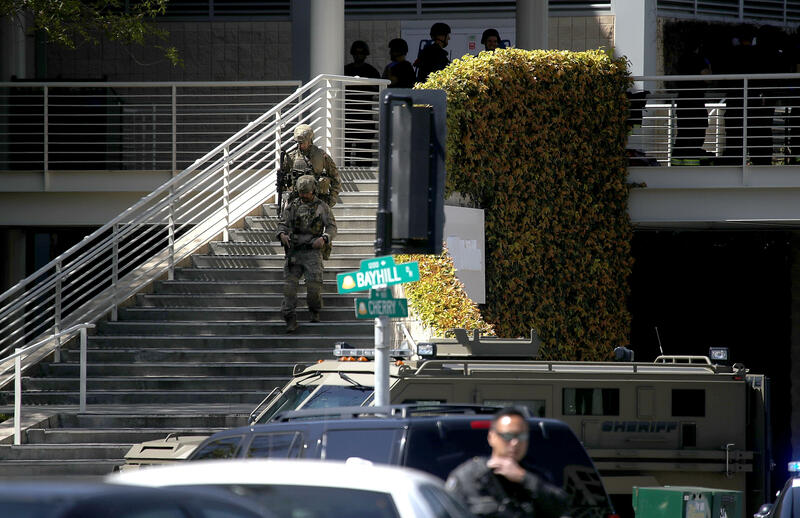 Terrified employees fled Tuesday as gunfire rang out at YouTube's sprawling headquarters, prompting a massive police response and evacuation as victims were transported to nearby hospitals. Hospital officials say a 36-year-old man in critical condition, a 32-year-old woman in serious condition and a 27-year-old woman in fair condition. Schildkraut cautioned it's still too early to know what caused her to allegedly open fire, and San Bruno police say they are still in the early stages of the investigation they are still working to identify a motive for the shooting. In several videos posted to the platform, Aghdam accused YouTube of censoring her and expressed anger to the company. Aghdam told family members she thought YouTube was "ruining her life," reports CBS Los Angeles. Earlier reports indicated the suspect may have known one of the victims, but police said late Tuesday that "at this time there is no evidence that the shooter knew the victims of this shooting or that individuals were specifically targeted."